The Event Editor holds automation data that moves linked controls according to the curves recorded, set or drawn. Event automation is closely related to Automation Clips but differs in two main ways. 1. Event Automation is bound to a specific Pattern, Pattern Clip. Automation Clips are not, they are a type of generator' plugin. 2. Event data can be recorded from live controller movements or drawn into the Event Editor by hand. Automation Clips can be edited only, you can't record one. Although you can convert Event Data to Automation Clips. NOTE: You can convert recorded Event automation data to Automation Clips with the Menu > Edit > Turn into automation clip option. Main Menu - Includes: File, Edit, Tools, View, Snap, Zoom, Target and Smoothing options. Tools Menu - Includes: Scale Levels and LFO tools. Snap - Controls the time resolution (horizontal). E.g. a setting of '(none)' will allow the finest resolution while 'Beat' will only allow value changes on every beat. Draw tool ( P) - Left-click and drag to draw freehand. Right-Click and drag to draw straight lines. Modifier keys: ( Shift) - Lock vertical position. ( Ctrl) - Select time-line. ( Alt) - Bypass snap. Paint tool (brush) (B) - Bypasses the snap value. Right-Click and drag to draw straight lines OR to edit in interpolate mode. Modifier keys: ( Shift) - Lock vertical position. ( Ctrl) - Select time-line. Erase tool (D) - Resets data to the value at the start of the selected range. Modifier keys: (Ctrl) - Select time-line. Interpolate (I) - Redraw and connect data with straight lines. Select tool (Left Mouse) - Make a time-line selection. Zoom tool (Z) - Zoom the time-line. Right-Click to zoom out. Event Editor Target - Select any Event Automation data in the currently selected Pattern. Browse all automation in the project using the Browser > Current project > Patterns folder. The Event Editor will only show data from the selected pattern. Use the Toolbar Pattern Selector or Playlist Picker Panel to change patterns. Convert Event Automation to an Automation Clip by selecting 'Turn into Automation Clip' from the Event Editor Menu. The Event Editor is the location for all recorded automation. Remember, the pattern selected during recording holds the Automation data. Event Automation can be manually edited and drawn. A single pattern may contain multiple Automation Events, use the Target menu to swap between Event Automation data for the selected pattern. Patterns may contain an unlimited number of Event Automation data-sets. 1. Select the Pattern that will hold the Event Automation, Right-Click the control to be automated, then select 'Edit events'. If automation data was recorded for the control, the data will be displayed and it can be edited. If there is no pre-existing Event Automation data then it can be manually drawn and saved (simply close the editor when you are done). 2. Use the Browser > Current project > Patterns > 'Pattern name' folder. Left-click on an Event Automation file to open the Event Editor. NOTE: This will only be possible if Event Automation data exists somewhere in your project. From the Piano roll - Event Automation data can be displayed and edited in the lower panel of the Piano roll. Select a Pattern containing the automation data, then select the Event Automation data from the Target Control menu. From the Playlist - Event Automation data is shown as shading in the clip. If you would like Event Automation data to be independent of patterns, use the closely related Automation Clip. Event Automation data can be converted to an Automation Clip using the Edit > Turn into automation clip command in the Event Editor Main Menu. NOTE: To link other controls to Event Automation data - First convert the Event Automation to an Automation Clip through the Event Editor Menu > Edit > Turn into Automation Clip. The Automation Clip will now appear as an 'Internal controller' link option in the 'Link to controller' Right-Click dialog on automatable controls and also in the Browser > Current project > Remote control list. Sometimes it is useful to closely align Event Automation data with an audio waveform. For example when using Fruity Vocoder or Pitcher. 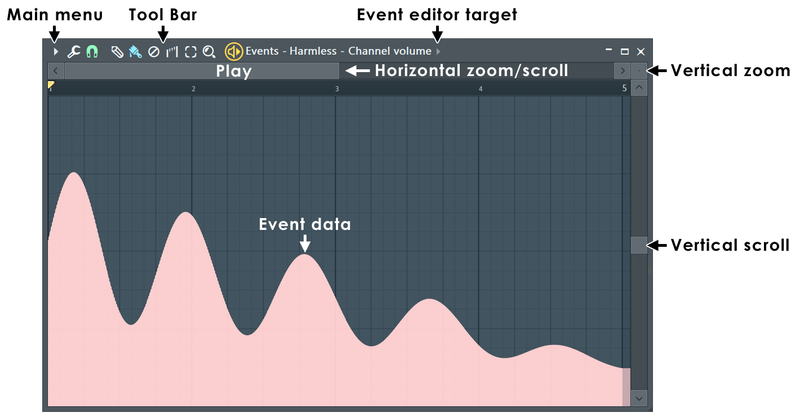 To show the waveform drag from a waveform preview and drop on the Event Editor. To switch the view on and off after this, use (Alt+N). The Event Editor graph shows time on the horizontal axis (measured in bars) and automation values on the vertical axis (0 to 100%). The time segments of the Playlist are set by the window's 'snap' parameter ( ). Alternatively, selecting 'Main' will implement the global snap value as defined in the Snap Panel. Events are displayed as vertical lines (height represents the value of the event). The Event Editor window can display only one event data-set at a time. 1. Select a Pattern and Right-Click the target control, then select 'Edit events'. If automation data was recorded for this target, the data will be displayed and can be edited. If there is no pre-existing Event Automation data then it can be manually drawn and saved. 2. Use the Browser > Current project > Patterns > 'Pattern name' folder. Left-click on an automation target to open the Event Editor. To switch between displayed events in the currently opened Event Editor (or to open a new one if none are open). You can also select Edit Events in New Window, to open a new Event Editor window. Remember, the Event Automation data visible using the Event editor target menu will depend on the Event Automation data in the selected Pattern. Create an event - In the Event Editor, switch to Draw Mode ( ) or Paint Mode ( ) and Left-click in the Event Graph Area. You can also create whole curves of events - just Left-click and drag to create the desired shape. To create straight lines of events instead, Right-Click in the grid and drag. Draw Mode and Paint Mode are identical, however Paint Mode ignores the current snap settings, allowing you to draw smooth curves without changing your snap preferences. Interpolate between events - Use the Interpolate Mode ( ). While in this mode, Left-click and drag to select the events to be interpolated. The events you select will be marked in blue. When you release the mouse button, all selected events will be refined using linear interpolation. To use spline interpolation, drag using the right mouse button instead. Erase events - Use the Erase Mode ( ). While in this mode, Left-click and drag to select events to be removed. Selected events will be marked in red and deleted when the button is released. Select events - In any mode (draw, erase, interpolate), double-click or (Ctrl+click) the time ruler and drag to select a time range. You can also use Select Mode ( ) to select with a single Left-click and drag. Selections are used when cutting events and using the LFO tool (see the menu commands described below). Tools Menu ( ) - This is a shortcut to the window's tools submenu, containing various commands for operating on patterns in the Playlist. Tweak or move the target control on the plugin. Then use the Main menu option Tools > Last tweaked > Edit events. Use the Browser > Current project > Effect or Generators folder to see MIDI CC parameters for all controls the plugin publishes to the host (FL Studio). Then Right-Click the target and select Edit events. The Event Editor Main menu provides useful commands for editing events. You can access this menu by clicking the Event Editor menu icon. Open Automation - Imports automation data from a score file (*.fsc) into the current Event Editor. Save Automation as - Saves automation data from the current Event Editor to a score file (*.fsc). Import MIDI (Ctrl+M) - Shows the Import MIDI Data dialog box where you can import controller data (cutoff, resonance, etc.) from a MIDI file to the Event Editor. Paste from MIDI clipboard (Shift+Ctrl+V) - Same as the Import MIDI command, but uses MIDI clipboard data rather than a MIDI file. You can paste data from several different sequencers that can copy to MIDI clipboard format (e.g. Cakewalk Pro Audio (TM)). Cut (Ctrl+X) - Cuts all selected events to the clipboard. Select an area to cut, otherwise this command will be disabled. Copy (Ctrl+C) - Copies all selected events to the clipboard. Select an area to copy, otherwise this command will be disabled. Paste (Ctrl+V) - Pastes events from the clipboard to the current Event Editor. If an area is not selected, the events will be pasted in the beginning of the pattern. Delete (Del) - Deletes all selected events in the Event Editor. If no selection is made deletes all Event data. Select All (Ctrl+A) - Selects all events in the Event Editor. Select Previous (Ctrl+Left) - Moves the selection backwards so that the start of the selection matches the new selection end. For example, if you select a bar, this command selects the previous bar. Select Next (Ctrl+Right) - Moves the selection forward so that the end of the selection matches the new selection start. For example, if you select a bar, this command selects the next bar. Insert Space (Ctrl+Ins) - Creates "empty" space that matches the current selection by shifting the following events forward. Delete Space (Ctrl+Del) - Erases all events in the current selection and shifts back the following events to close the gap. Insert Current Controller Value (Ctrl+I) - Initializes the Event Editor with the current value of the corresponding automated control. If you have selected a time slice in the graph, the current value will be inserted at the beginning of the selection. Turn into Automation Clip - Converts the current event pattern into a new Automation Clip. Scale Levels - Multiplies/offsets/inverts the events in the event editor or maps the events to a logarithmic/exponential scale. See Scale Levels for more info. LFO (Ctrl+L) - Shows the LFO dialog, where you can draw LFO shapes in the Event Editor. Grid Color - Opens a standard Windows Color dialog box, where you can set a color for the Event Editor grid. Detached - When checked, the window is "detached" from the main environment of FL Studio and can be maximized on a second monitor (in a dual monitor setup). Invert grid - Changes the bar-grid lines from light to dark. Precise time indicator - Uses a vertical line through the editor window to show playback and edit position. Helpers - Background waveform (Alt+N) - When a waveform has been dragged and dropped on the Editor, displays the waveform to aid note alignment with audio events. Line - Events snap to the nearest grid-line, notice that the grid changes resolution as the Event Editor is Zoomed horizontally. Cell - Events snap to the start of the grid-cell they fall in. (none) - No snapping. Movement is limited only by the Project Timebase (PPQ) setting (F11). NOTE: Snapping can be temporarily disabled by holding the Alt key when dragging Events. Target control - Each pattern can store a number of Event Data-sets, this menu item opens a list of the Event data-sets in the Pattern. Relocate Events - When deselected, paste commands will overwrite any existing events and Cut/Delete commands leave gaps. When selected, pasted commands will be insert and the Cut/Delete commands will shift forward all events after the selection. Auto Smoothing - When checked, the drawn events are automatically interpolated upon release of the mouse button. Center (0 (zero)) - Scrolls the timeline so that the playing position marker appears in the middle. This is a useful option if you want to see the playing position within a long sequence.